Yeah, I’ve got a bit of overdue art here. 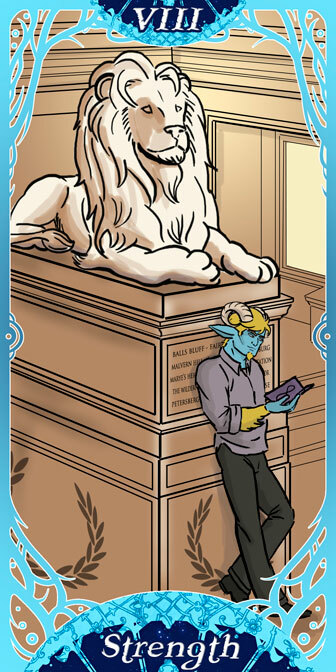 This bit is for the Webcomics Tarot by Senshuu. Technically, there was no due date for the piece, but I got the assignment over a year ago. I struggled to do an image that meant something. The card is pretty rife with symbolism, but its not an image that talked to me. And who among my characters really symbolized self control and inner strength? That’d have to be Geoff, who is easily the strongest out of all the main characters. But he really doesn’t know that he’s a powerhouse, he’s more of an intellectual. And the lion has layers of symbolism as well. In the traditional tarot images, the lion is being tamed by a maiden, showing the inner beast being restrained. Here the lion is one of the ones that greet visitors to the main entrance of the Boston Public Library. And strength, this inner kind of quiet strength, is something I’ve been searching for lately. It’s been a tough year for many, many reasons. Some good, some bad. I think I need to trust that it’s always been there, but the beast has been roaring too loud for me to hear it.